Tomoe’s got a new home on YouTube. That’s right, I’ll be making plenty of videos with her. They’ll focus on her language development, as well as some fun stuff. So please subscribe! I’ve decided I needed to separate my daughter’s videos from the rest of my videos. So now, my main channel is about books and Japan. My new channel is all about my daughter, education, language, and just plain fun. So, if you’re interested in my daughter’s videos, you can subscribe to that channel. And of course, for book and Japan related videos, subscribe to my main channel. I made an introductory video, and here it is. Yesterday, we went to a new park that’s near Shonandai Station, though it is about a 30 minute walk to get there. It’s on the east side of the Sakai River, which means it’s in Yokohama. It has a birdwatching area, tennis courts, soccer field, baseball diamonds, and an interpretive centre that shows all the kinds of birds and fish in the area, as well as how they created the park. The northern portion, which is in Fujisawa, is still being built. It’s a pretty extensive project, and is quite nice. Looks great for both nature and sports. We went to the splash park next to the baseball diamonds, and it’s Tomoe’s first time wearing a swimsuit and spending any amount of time in water outside of the bathroom. The water was cold, but it was a hot and humid day at 31 degrees. The water felt wonderful. My wife and I got our feet wet, but Tomoe got her entire body wet. Here’s a short video of her time. After spending about 30 minutes there, we decided to go. The sun was strong, so we didn’t want to spend too much time out. However, Tomoe had other plans. She protested and cried for about 10 minutes. She was not happy. But I’d love to go again. That cold water felt wonderful. There’s one nearer our home at Akibadai Park, a sports centre that has a regular swimming pool, but you have to pay to get in. However, I want to go swimming. Here’s a little update with how things are going in Tomoe’s life. She talks a lot. Not just in English and Japanese, but also in gibberish. But her gibberish sounds more like Japanese than English. She’s learning new words at a very quick pace and understands how they connect with feelings, objects, and so on. She also hasn’t been sick lately. That’s a very good thing. No secondary nursery since January. She accidentally stole a toy that she forgot in her shirt (it was a toy thermometer) from that nursery, and we haven’t had the opportunity to return it yet. Anyway, I’ve taken a lot of videos recently, and thought I’d share them with you. Well, there you have it. Hope you enjoyed them all. Please subscribe to my YouTube channel! 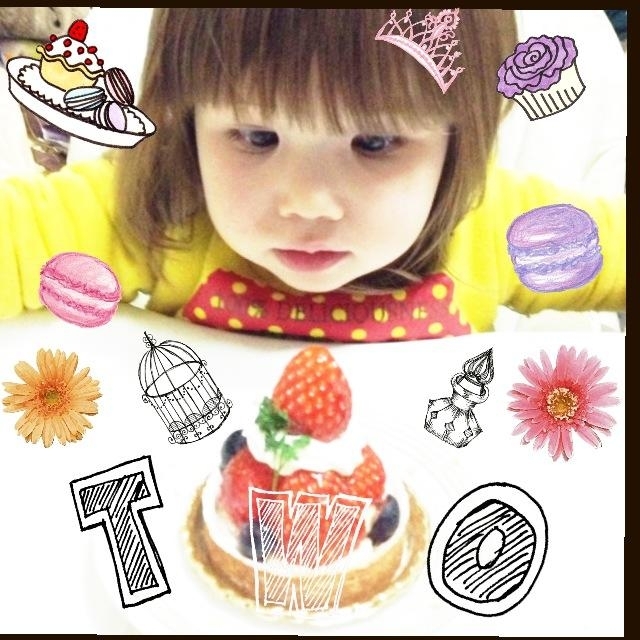 Yesterday was Tomoe’s second birthday. She had a strawberry and blueberry tart for a birthday cake, and she loved it. Photo was created by my wife. Now that she’s 2 years old, she’s entering the terrible twos. She says “no” a lot. She fights against going to bed a lot lately, too. Communication is getting better. She can ask for things by saying the word or pointing at it. She speaks mostly Japanese and gibberish with some English words, but she understand English directions pretty well. I’m making a bit of an announcement with this post, too. This is the last post I will write about Tomoe. At this age, she is an increasingly individual person, and deserves her privacy. I’d like to thank all of you who have followed her from being a tiny bean to a 2 year old toddler. However, that doesn’t mean this blog is finished. While it’ll be going into a kind of hibernation, I’ll keep it online, and occasionally write posts about raising children in Japan. But nothing specific about Tomoe. 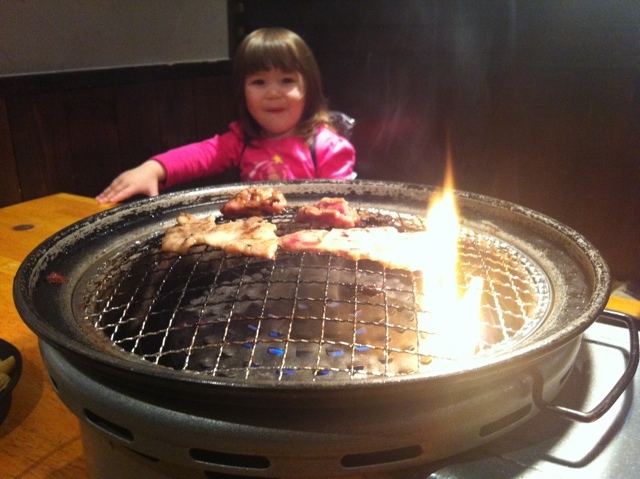 If we have a second child here in Japan, this blog will be resurrected. But since we plan to move to Canada by the end of 2016, we may have our second kid in Canada. But we’ll see about the future of this blog. Earlier this week, I saw a post on No Page Left Blank titled “31 Things No One Tells You About Becoming a Parent: A Response” and thought I’d leave my own thoughts on this list. Well, here they are. #1 – Make sure you don’t barbecue your kid. 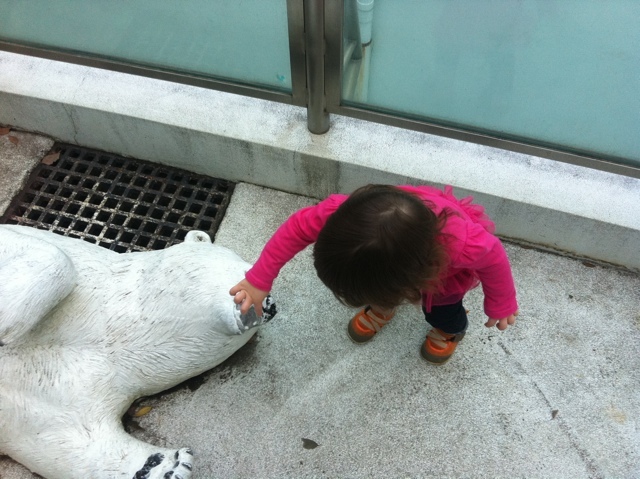 #2 – Don’t let polar bear cubs eat your baby. 1. At some point you will accidentally hurt your kid and you’ll feel like the worst parent ever. Yeah, this has happened. Tomoe’s had her share of getting bumped into or knocked over accidentally, and I felt horrible. I asked myself, “Will she hate me?” Within minutes, she was laughing and smiling, so obviously she felt fine. But at that instant, I couldn’t help but feel terrible. On the contrary, I keep up with world news quite a bit. I don’t feel behind at all. To be honest, it’s not so much about toys, but much more about kids TV shows these days. Especially Anpanman. I know the main characters, and kids I teach English to are surprised that I know their names. 4. Your Netflix account will eventually only suggest kids’ shows. Don’t have Netflix, but we do have Hulu. Not one kids’ show is on our queue. 5. Your pet will no longer be your top priority. This most certainly happened. We spend less time playing with our dog and more time with Tomoe. But as he died earlier this year, things have changed. 6. You will gain 15 pounds. Uh, no. The opposite. Over the past 3 years, I’ve lost 21 kg. Yeah, that’s right. 46 pounds. It has nothing to do with Tomoe and everything to do with not eating convenience store meals all the time. 7. The backseat of your car will be nasty. This doesn’t apply. We don’t have a car. 8. You will eat 95% of your meals either incredibly fast or with one hand. Or both. Due to my work hours, I get home after my daughter’s gone to bed (3 days a week) or get home an hour before she goes to bed (2 days a week). In either case, I eat after she’s gone to bed. No problem! But during the other 2 days, she gets fed first, then we eat. And yes, I sometimes have to defend my food while she gets upset that I’m not playing with her. It makes me take longer to eat. It should get easier soon, I hope. 9. You’ll basically become a ninja. With so many toys around as obstacles, this has actually been really difficult. I manage to bump one or two of them, and of course, they make a lot of noise. But thankfully, Tomoe sleeps through the sound. At times, she’s a pretty heavy sleeper. 10. Despite your best efforts, your kids will get their hands on your iPhone. Yes, she does quite often. But she knows I don’t want her playing with it, so she turns around and hands it to me. My wife’s iPod Touch, on the other hand, that’s a different story. She has a lot of games on it for Tomoe, so she’s got permission to use it. She knows how to unlock it, where to find the games, how to start the games, how to play them, and how to close the games. That’s right, she’s not even 2 years old, and she’s already an expert on how to use it. And there are plenty of random photos she’s taken of the floor. 11. Parenting is harder than you think it’ll be, but you won’t really notice. That is actually really hard to respond to. It’s been harder since she’s learned to walk. When she was a tiny baby, the difficulty was getting a full night’s sleep. But daytime was a breeze, outside of frequent diaper changes and feedings. Now, the difficulty is keeping her out of trouble. She does fairly well, surprisingly. But she makes a mess with her toys. But another thing that’s hard is to get her to stop talking so negatively about things. She says “no” and “dame (no, don’t, you can’t do that, I won’t do that, etc)” all the time, and has now started saying “hen na no (you’re weird/strange/a freak).” Guh. 12. You will have to sneak candy like it’s a contraband substance. Yeah, but not just that. Fruit, too. Especially tangerines and bananas. And any snack featuring pictures of Anpanman. 13. You will laugh more than at any other time in your life. Yeah, if I’m not frustrated. But she definitely has provided some big laughs. 14. You’ll be awakened at 2 a.m. to fetch a glass of water only to find your kid passed out when you deliver it. She’s never requested this, and isn’t very good with drinking from a glass, but she has woken up and asked for us. She usually wants to sleep in our bed with us. But sometimes, she’ll wake up crying, then fall asleep within a couple minutes. Still waiting for her to ask for water. 15. You will see your own faults reflected back at you. She copies everything! One of the strangest things is that when I’m at my computer and not using my mouse, she’ll reach over and pull my hand to my mouse. Am I really using it that much? When she’s in front of my computer, she always goes for the mouse, too. 16. Folding kid and baby clothes is torture. Not an issue. Really. They’re so small. 17. It’s impossible to feel manly when folding said baby clothes. Again, not an issue for me. 18. The power of cute is more formidable than you realize. Hell yes! I may be in a bad mood and Tomoe gives me a cute smile or pose, and it just makes me smile. She has a lot of power. 19. You will find talking to your friends without kids more difficult. Simply meeting any friends has become more difficult. Bed times, making sure I’m home in time for her to see me on weekends, and so on. I’ve become a servant of my daughter’s. 20. Kids become actual people and not baby blobs way sooner than you think. I’ve made a similar comment before about how my daughter seems like a real person now. She actually thinks, has likes and dislikes, and is rather creative. She is surprisingly creative! She impresses me a lot. 21. Something you love will get ruined. Not yet. She’s damaged earphones, folded a book cover, but that’s it. 22. You will turn into your parents. Some aspects, probably. I had quite a bit of freedom when I was a kid, but I tended to be well-behaved. Hopefully, Tomoe will learn to be responsible, so I can feel more confident about her ability to be independent. 23. Very little will embarrass you. Those parents with noisy kids in the supermarket now have my understanding. But I also realise just how I don’t care what others think of me when my daughter is shouting for Anpanman cookies and I ignore her. Believe me, nothing will shut her up. She already has Anpanman cookies at home. 24. You won’t be able to watch movies where kids are killed or kidnapped. Not really. On the contrary, it gets my protective feeling heightened. If I see a movie where a kid is kidnapped and the parents have to try to get the kid back, all I want is for that parent to beat the crap out of the kidnapper. It’s only natural to want to protect your kid. I can still watch those movies. 25. You won’t want to spend money on yourself because you’ll know every dollar spent on yourself is a dollar you could’ve spent on your family. I’ve always been this way. There’s been no change. 26. Buying your kid something will make you way more happy than buying yourself something. Absolutely. I love seeing that happy face. 27. When your kid is little, every trip out of the house will feel like getting ready to go to the airport. How true this is. And having to pack extra diapers and wet wipes, as well. Getting her back into the house is like having to unpack. It’s so much effort to go anywhere, especially if we have to take the bus. The bus is the most difficult thing about going anywhere with my daughter. 28. You will love to watch kids’ movies. Honestly, I always have. Now I have an excuse to be able to watch them. 29. 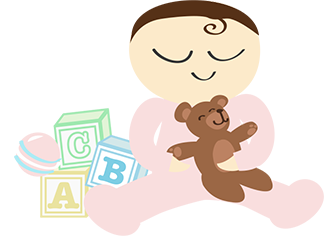 You will cram your entire adult life between the time your kid goes down and you go to sleep. Very true. I also love nap time. But since Tomoe goes to a nursery some days every week, I also have a bit of time in the morning before I go to work. Those are precious times for me. 30. For a while, only you will be able to understand them, so you’ll basically become their interpreter. 31. And lastly, it’s all worth it. Yes. See my previous post. So, how about you? I want to hear some responses. Nothing can prepare you for parenthood. Absolutely nothing. When I became a parent, I felt something I’ve never felt before, something that is incredibly difficult to describe in words. I can’t compare it with anything. She loves drawing. She chooses the yellow crayon and hands the rest to me. She points to where she wants me to draw. I go away for a bit and sit at my computer. She comes over and takes my hand, saying “Oide.” She wants me to draw some more. I wonder if she’ll be an artist. I wonder if she’ll be a dancer. I wonder what she’ll do in her life. Yesterday, I took Tomoe to the playground, and she went on the swing, then we went down a very long slide together. As we were walking, she reached up and wanted me to carry her. As I was carrying her, I had a very brief conversation with her. I’ll be brief, but only because Tomoe’s standing right in front of me watching me type this. She is absolutely obsessed with Anpanman. She talks about it non-stop everyday. She wants to see pictures and videos of Anpanman. What is Anpanman? It’s a kids’ cartoon in Japan about a superhero whose head is made of anpan (a bread with a sweet bean paste filling). This is Tomoe’s obsession. She loves this video. It’s a dance that she loves to do. Go to 1:45 for the start of the actual dance.